Dream, Create, Inspire: A Call For Celebration! We're doing a "happy dance" at our house. Well, actually I am the one who is dancing. DH is still a little sleepy, but I'm sure he is dancing in his dreams! What a great reason to be happy!!! Congrats! 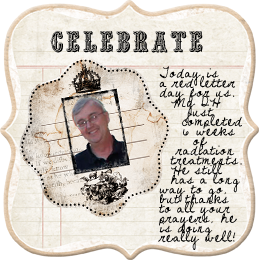 OH Jeanne, I'm so happy your husband is doing better, and the radiation treatments are finished! I've been so absorbed in other things lately I'm afraid I haven't been a very good friend about checking in, but I want you to know I have been thinking about you a lot and saying a prayer for your husband.